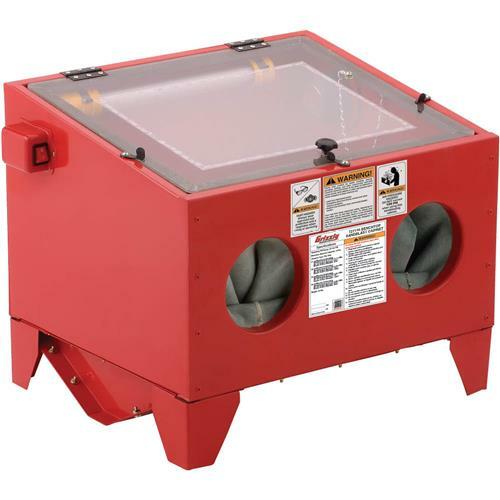 This top-loading Benchtop Blast Cabinet can be filled with a variety of abrasive materials for cleaning, polishing, and finishing. Sealed gloves allow complete access inside the enclosed cabinet for operating the blast gun and moving the part. Includes blasting gun with 4 ceramic tip sizes and a built-in fluorescent lamp. Overall size is 23-3/4" wide x 19" high x 19" deep. Approximate shipping weight is 40 lbs. I have not had a chance to use this sand blaster yet. Its very well made. I put some media in it but havent got it to work yet. Very little instructions included. I havent used the cabinet yet as Im still building my shop and will do another review once I have it set up and use it for restoring parts on my 71 Chevy truck!! I have used with a smaller air compressor and works well, I am planning to try it with my Ingersol Rand industrial compressor, should be perfect with the air volume. Overall good. Some air leakage around lid, could use a better quality plug (I had to replace mine). It was sufficient for a week of full-day blasting. As expected, the shallow sand pit is less than ideal, if you want a deeper pit you&#39;ll need a more expensive unit.